Greenfield Architects performed design services for interior renovations to all three floors of the existing Life Long Learning/Educational Building for a private university in Southeastern, PA. Renovations on each floor included 17 offices, conference room, public restrooms, reception area and classrooms. The design was accomplished in three phases over a three year period, although the predominant design work was completed in the first phase in order to establish the utility and life safety requirements for renovations on all three floors. The project involved extensive MEP and space planning upgrades. Each phase impacted the other floors associated (i.e. chases, utilities, etc.) New finishes were provided throughout the building in the Phase where the work was designated. New Restroom facilities were provided on all floors per Phase, MEP systems were upgraded in designated areas. Interior room layouts were revised with new partitions, doors, and frames, floor, wall, and ceiling finishes, MEP systems, electrical wiring, new fixtures, and a new EPDM roof replacing the existing built-up roof. Asbestos abatements throughout. 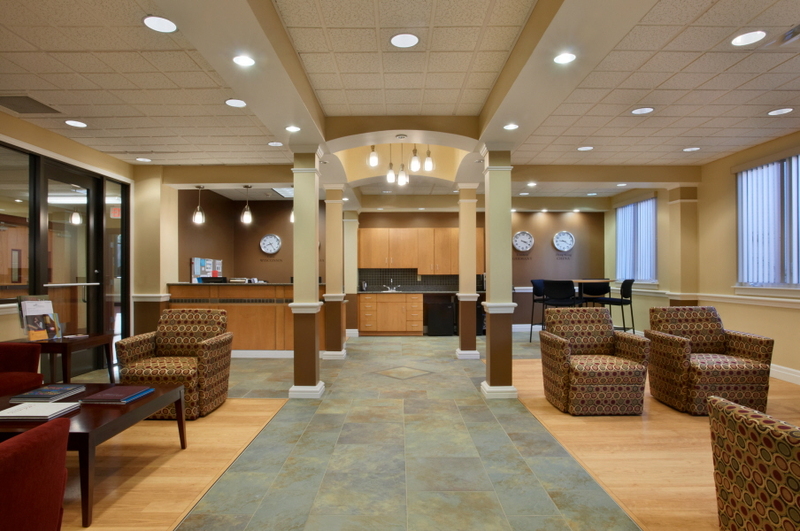 Greenfield Architect’s also designed the Student Welcome Center as part of the overall three phase renovation project. Existing classrooms were demolished on the Second Floor and the new Welcome Center was designed adjacent to the two-story atrium space. The Welcome Center was created as a place for students to meet with University Officials to become acclimated to the programs and facilities offered to the student body. The Welcome Center included a full wall of windows to maximize exposure from the main corridor to increase visibility and access. A reception counter was provided to welcome students to direct them to the appropriate University representative office. A small coffee / lunch area was provided for relaxation, internet access, and small lunches or beverages. As additional larger area was created for students to lounge and read University literature as well as watch a high definition video of student activities and educational programs offered. A conference room and three offices were also provided for family meetings or individual student meetings with university officials.